Background: With the increasing number of cataract surgeries, incidence of posterior segment complications including rhegmatogenous retinal detachment (RRD) is likely to rise. Scleral buckling (SB) surgery is an effective and less expensive option. The primary advantage of non-drainage procedure is avoidance of possible complications associated with trans-choroidal drainage. The aim of present study is to describe the clinical profile of subjects undergoing non-drainage SB surgery with solid silicone elements for RRD and analyze their treatment outcomes. Materials and Methods: This was a retrospective, non-randomized, interventional study at a tertiary care center. Three hundred and six eyes of 298 patients undergoing non-drainage SB surgery with solid silicone elements from year 2000 to 2006 were included. Inclusion criteria were primary RRD, peripheral depressible retinal break, media clarity affording peripheral retinal view and proliferative vitreo-retinopathy (PVR) up to grade C2. Uni- and multivariate analyses was done to analyze factors affecting anatomical and visual outcomes. Statistical analysis was performed using SPSS Version 10. Results: Mean follow-up was 303 ± 393.33 days. Primary anatomical success was obtained in 279 (91.2%) eyes; primary functional success in 286 (93.5%) eyes. PVR (grade B or C), intraocular pressure <10 mm Hg and the inability to find a retinal break were significantly associated with final anatomical failure. Baseline vision ≤3/60 was significantly associated with poor visual recovery. Conclusions: SB surgery is reasonably safe and highly efficacious. Solid silicone elements are effective in non-drainage SB surgery. However, case selection is important. Purpose: To compare the efficacies of punctal plug insertion and Botulinum toxin injection in dry eye disease not responding to topical medications. Materials and Methods: A non-controlled randomized clinical trial of two parallel groups of 60 dry eye patients seen in the clinic not responding to topical medications were divided into two groups. One group received punctal plugs and the other group received Botulinum toxin injections to prevent lacrimal tear drainage. Results: Of a total of 36 patients with a mean age of 44.5 years who received punctal plugs, 50% of them experienced improvements in the clinical manifestations of their disease. 12/36 (33.3%) developed plug extrusion, and 6/36 (16.7%) patients developed conjunctival erosions with irritation that necessitated plug removal within one week of insertion. A total of 24 patients with a mean age of 47.5 years received injections of Botulinum toxin. Of these, 83.3% had improvement in all of the clinical manifestations of dry eye. 4/24 (16.7%) had no improvement in the degrees to which they experienced foreign body sensations, 33.3% reported shampoo entering the eye while showering. 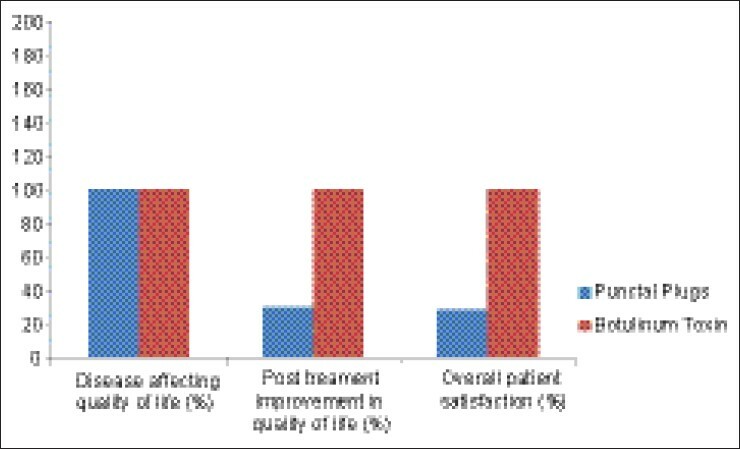 All of the patients who received Botulinum toxin injections were satisfied with the results of their treatment, whereas only 72.3% of the patients who received punctal plugs were satisfied with their results. Conclusion: Botulinum neurotoxin A injections can be a very good alternative to punctal plugs in improving the clinical manifestations of dry eye disease They are associated with the development of fewer and milder complications and with higher levels of patient satisfaction. The ancient schwannoma is a rare variant of a neurilemoma with a course typical of a slow-growing benign neoplasm. Histologically, it can be confused with a malignant mesenchymal tumor because of increased cellularity, nuclear pleomorphism, and hyperchromatism. Despite the degree of nuclear atypia, mitotic figures are absent. We describe the clinical and histopathologic features of an ancient schwannoma of the orbit. A need for early removal of such tumors is recommended to prevent complications. Cornelia de Lange syndrome (CdLS), also called Brachmann-de Lange syndrome, is a multiple congenital anomaly syndrome characterized by a distinctive facial appearance, ophthalmological abnormalities, prenatal and postnatal growth deficiency, psychomotor delay, behavioral problems, and malformations of the upper extremities. Most common and consistent ophthalmic features reported are nasolacrimal duct obstruction, long and curly eyelashes, blepharitis, ptosis, synophrys, telecanthus, hypertelorism, microcornea, peripapillary pigment ring, and myopia. In this report we report a case of a 5-year old boy who presented to our institution with complaint of blurring of vision in the right eye since birth. A diagnosis of Cornelia de Lange syndrome was arrived at based on the characteristic external and ophthalmic examination. He was found to have a rare association of optic nerve head coloboma in the right eye and a novel finding of an optic disk pit in the left eye. The association of optic disk pit with CdLS has never been reported earlier. We aim to provide a thorough review of literature of this not so uncommon syndrome. Lung carcinoma is the leading cause of cancer-related deaths and is the primary source for choroidal metastasis in over 20% cases. Non-small-cell lung cancer (NSCLC) accounts for 85% of all lung cancer cases. Patients with metastatic NSCLC have a median survival of one year. Successful treatment of systemic metastasis from NSCLC using erlotinib has been documented. The effect of oral erlotinib on choroidal metastasis has been rarely reported. We document a case and study the effect of oral erlotinib on choroidal metastasis from NSCLC. A 48-year-old Caucasian female presented with biopsy-proven primary NSCLC with systemic metastasis and solitary choroidal metastasis of 4.8 mm thickness in the right eye. The patient was treated with 100 mg daily dose of oral erlotinib. 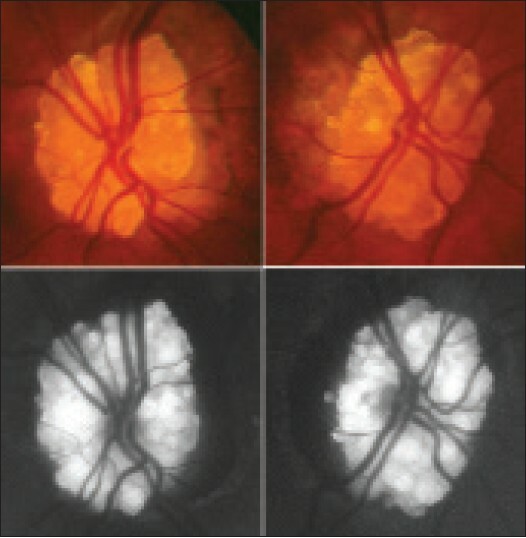 Two weeks after starting erlotinib therapy, the patient showed complete regression of choroidal metastasis to a flat scar with resolution of subretinal fluid and improvement of visual acuity from 20/100 to 20/25. There was no evidence of recurrence at five-month follow-up. Erlotinib is an alternative therapy for choroidal metastasis from NSCLC. Though choroidal osteoma is a rare benign tumor, associated choroidal neovascularization (CNV) can be a cause of severe visual loss. 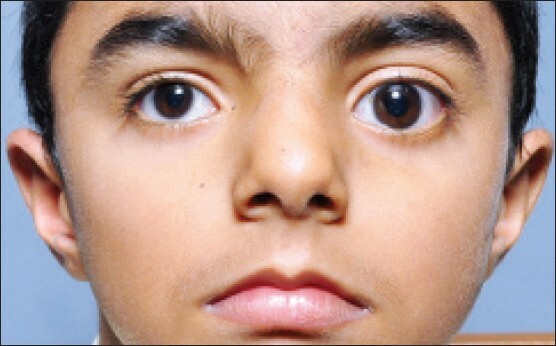 A nine-year-old boy presented with one-month history of decreased vision in left eye. 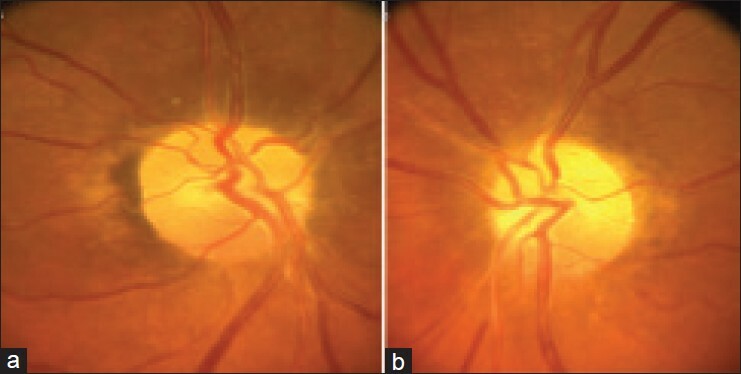 Upon a complete ophthalmologic examination, including fundus fluorescein angiography and optical coherence tomography, he was diagnosed with choroidal osteoma-related subfoveal CNV in the left eye. The CNV was associated with subretinal hemorrhage, subretinal fluid, and cystoid macular edema. Owing to the young age and subfoveal localization of the CNV, intravitreal ranibizumab injection was performed on this patient after a detailed discussion with the parents of its safety profile. No local or systemic complications were noted. No recurrence of CNV lesion was noted during 30 months of follow-up, and the vision was maintained. This report shows the favorable outcome of intravitreal injection of ranibizumab in choroidal osteoma-related CNV in a child. Leiomyoma is a rare intraocular tumor that arises from uveal smooth muscle. Herein, we report a large leiomyoma that occupied nearly 50% of the globe, closely resembling melanoma. A 40-year-old female presented with a 17 x 15 x 11 mm amelanotic ciliochoroidal mass causing visual defect in her right eye (OD). Based on transillumination features of tumor shadow and ultrasonographic features of acoustically solid mass, there was low clinical suspicion for leiomyoma or schwannoma, and a preliminary diagnosis of ciliochoroidal melanoma was rendered. 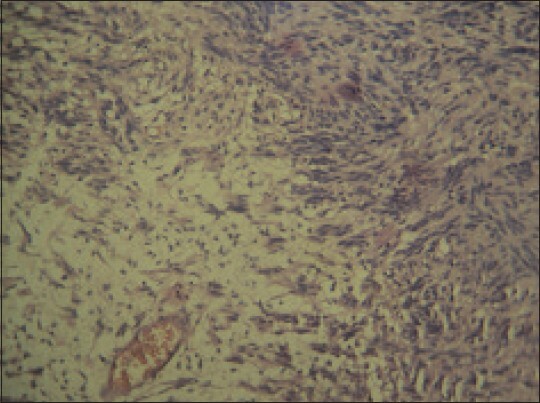 Following enucleation, histopathology revealed a paucicellular tumor comprised of spindle cells, with positive immunostaining for smooth muscle actin and negative stains for melanoma markers (S-100 protein, HMB45, and MITF-2). These features were consistent with ciliochoroidal leiomyoma. Benign uveal leiomyoma can achieve an unusually large size and block light transmission on transillumination, features that simulate malignant melanoma. Optic disc drusen (ODD) are extracellular proteinaceous excrescences in the optic nerve head. They enlarge over time and can cause damage to nerve fibers with resulting loss of visual field. 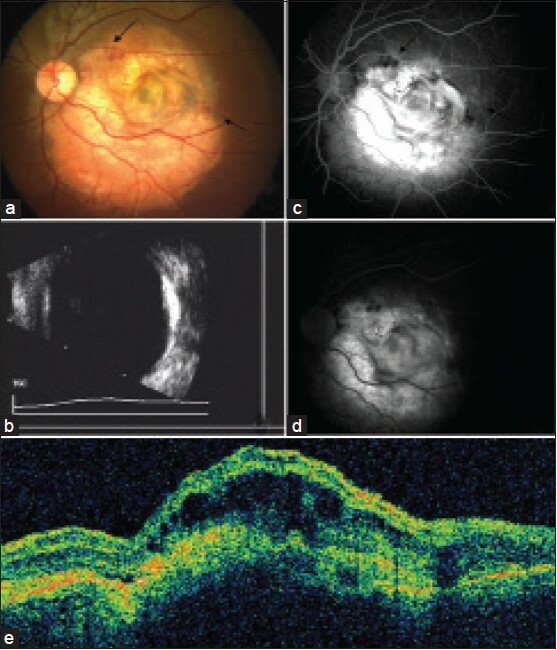 The authors report a case of advanced ODD in which macular optical coherence tomography demonstrated retinal nerve fiber thinning. 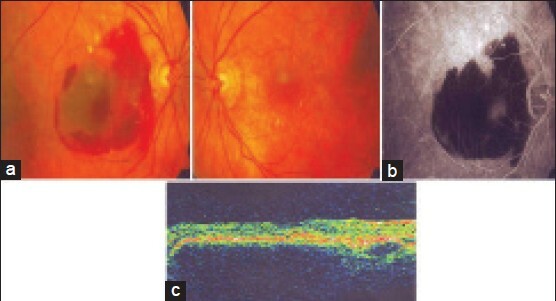 A single case report of a 42-year-old woman with known ODD presented to the eye clinic with worsening field of vision which was impacting on her daily life. The patient was subject to full ophthalmic examination as well as Goldmann visual field testing, optic disc photography and optical coherence tomography (OCT) of both her optic discs and maculae. ODD although rare, can be visually devastating. No treatment is currently available however patients should be counseled about progressive nature of ODD and the potential for visual loss. 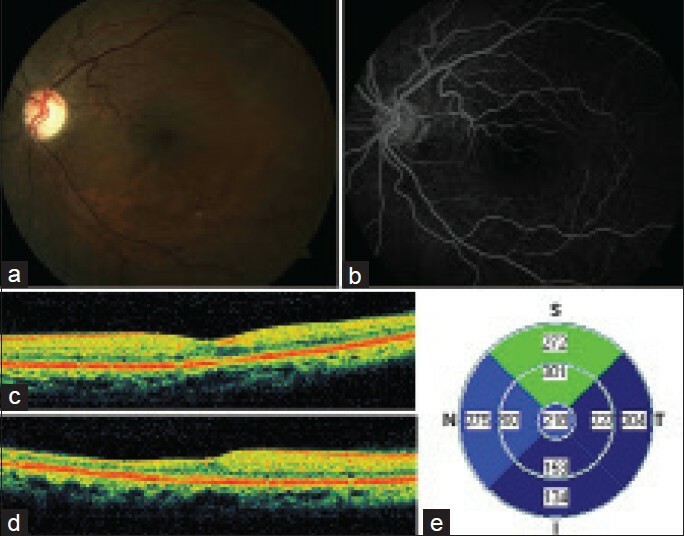 OCT imaging of the maculae as well as optic discs may serve a role in monitoring the damage disc drusen cause to the eye. 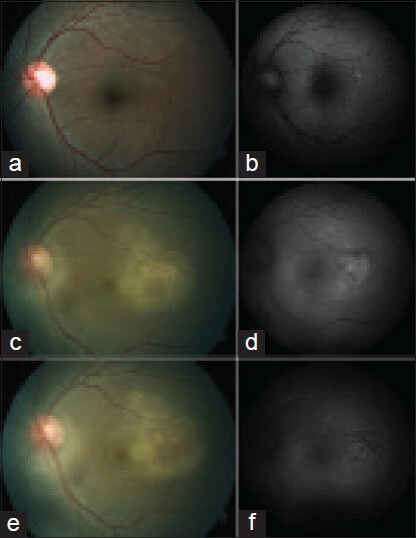 To highlight the similarity in onset, clinical course, and resolution of central serous chorioretinopathy in two eyes, in two consecutive pregnancies in the same patient. A case report. 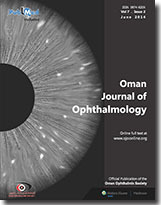 Snellen visual acuity, slit-lamp examination, and optical coherence tomography (OCT). 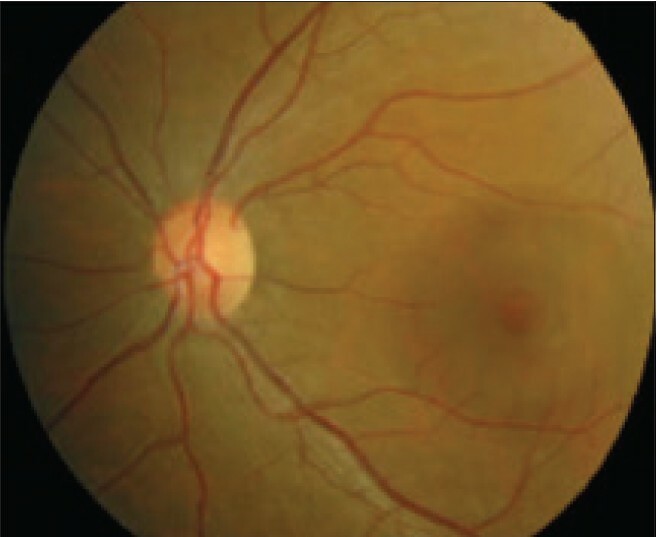 A 31-year-old female had central serous chorioretinopathy with sub-retinal exudates in left eye during the sixth month of her first pregnancy and later in right eye also during the sixth month of her second pregnancy two years later. 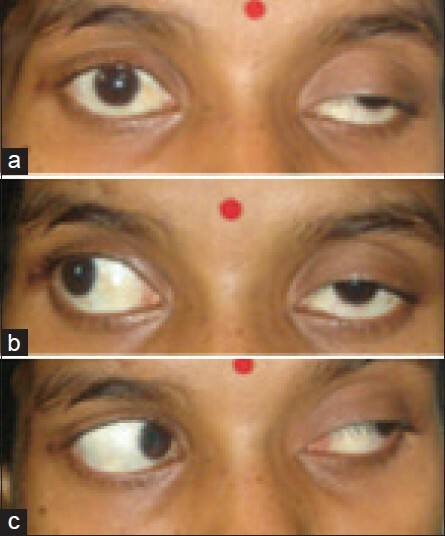 Both eyes had spontaneous resolution of the lesions with final visual acuity of 1.0 each eye. To the best of our knowledge, there have been no reports of alternating CSCR with sub-retinal exudates, occurring exactly in the sixth month of two consecutive pregnancies, two years apart, with spontaneous resolution after deliveries. We report an unusual case of Axenfeld-Rieger Syndrome with secondary glaucoma managed with Ologen® implant. A 35-year-old male presented with complaints of decreased vision in both eyes of 22 years duration. His best corrected visual acuity (BCVA) was no perception of light in right eye and 20/30 in left eye. Gonioscopy revealed anterior insertion of iris into trabecular meshwork, prominent iris processes and broad-based synechiae with prominent Schwalbe's line along the angle circumference with cord-like structures taking its origin at the level of Schwalbe's line in both eyes. Fundus examination revealed total glaucomatous optic atrophy in right eye with 0.9:1 cup disc ratio with bipolar notch in left eye. 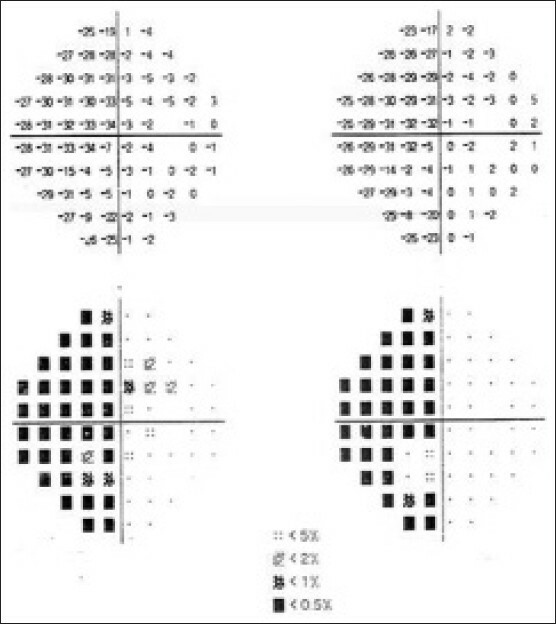 Humphrey visual field analysis showed superior and inferior arcuate scotoma in left eye. Intraocular pressure measured by Goldman applanation tonometry was 30 mmHg and 26 mmHg in right and left eye, respectively. After an unsuccessful medical management, he underwent trabeculectomy with Ologen® implant under local anesthesia in his left eye. 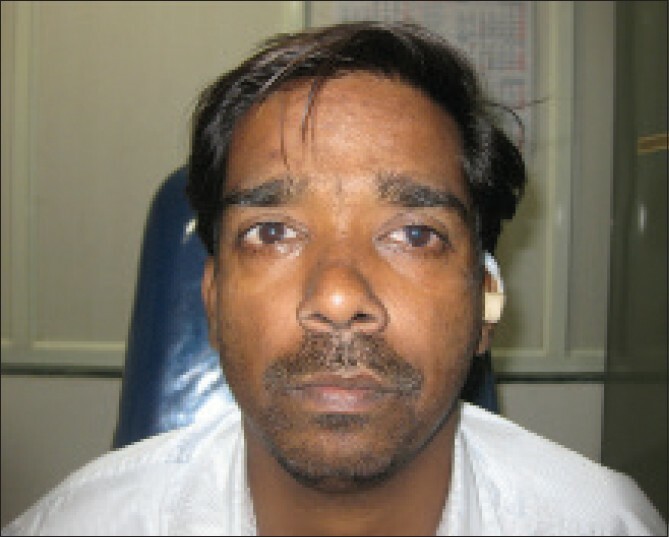 Postoperatively, at the end of one year, intraocular pressure (IOP) in his left eye was controlled without medication. This case highlights the management of secondary angle closure glaucoma in Axenfeld-Rieger syndrome with Ologen® implant. Background: Intraocular medulloepithelioma arises from the primitive medullary epithelium and is diagnosed at a median age of five years. This tumor most commonly appears as a white, gray, or yellow-colored ciliary body tumor. The growth of medulloepithelioma is slow and it is locally invasive. Poor vision and pain are the most common presenting symptoms. The most common clinical signs include cyst or mass in iris, anterior chamber or ciliary body, glaucoma, and cataract. Case: A 22-month-old Caucasian female twin presented with leukocoria and poor vision in OS. Examination revealed normal findings OD and a mass in OS. 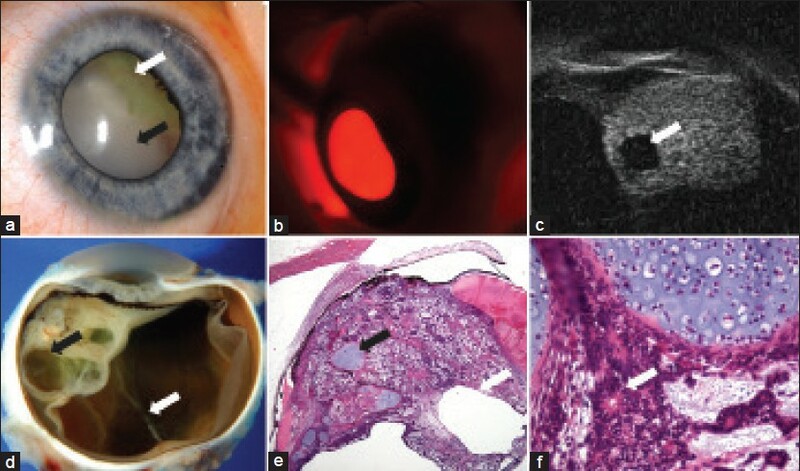 Based on the clinical features of leukocoria, lens changes and a white cystic ciliary body mass in a young child, ultrasonographic, and transillumination features, the lesion was diagnosed as a non-pigmented ciliary epithelial medulloepithelioma. After enucleation, the diagnosis of malignant teratoid medulloepithelioma of the non-pigmented ciliary epithelium was confirmed. There was no evidence of tumor recurrence or systemic metastasis at three years follow-up. Conclusion: Medulloepithelioma in a child can present as a clinical triad of leukocoria, lens changes, and a white cystic ciliary body mass. A congenital retinal macrovessel (CRM) is a large retinal vessel, usually a vein, which traverses through the central macula and has large tributaries extending on both sides of the horizontal raphe. 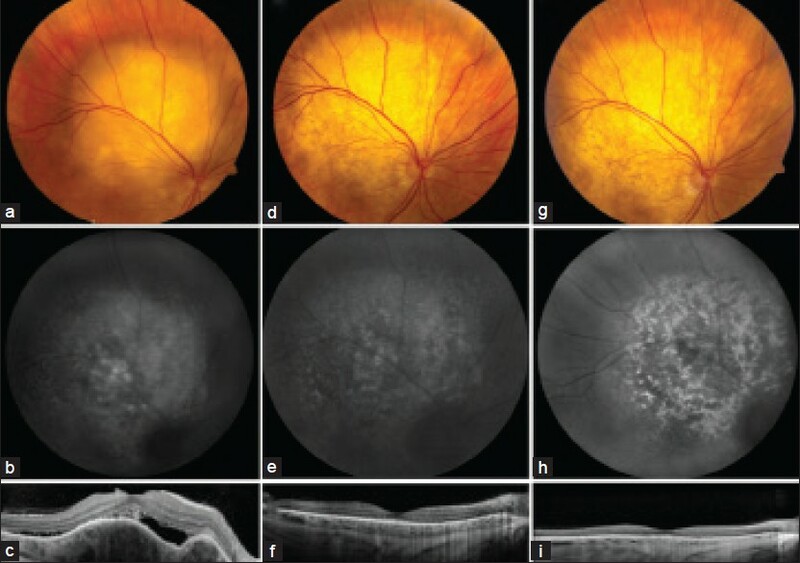 In the majority of cases, CRM have no effect on visual acuity, although in rare cases, macular hemorrhage, foveolar cysts, serous macular detachment, and the presence of the anomalous vessel in the foveola can affect vision. We describe a case of CRM with decreased vision secondary to a branch retinal artery occlusion (BRAO). To the best of our knowledge, this association has not been reported previously.